Heavy Duty Monster Bin 2700 Series | BARR Plastics Inc. The seamless, one-piece construction of these monster bins allows for easy cleaning and sanitation. Its lighter weight allows the bin to be much easier handled than stainless steel bins, and they cost less too. Their extra thick corners and base resists impact and wear while their reinforced top edge adds strength and resists splitting. 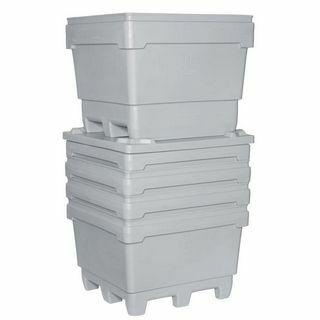 They are nestable and stackable 2-high with optional lids and the 2700 series bins have a footprint of 48"l x 44"w.